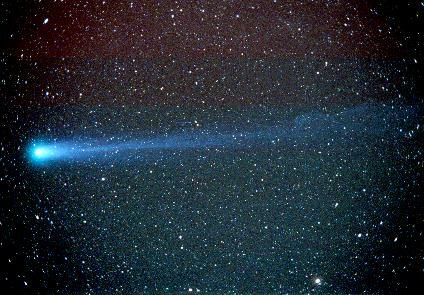 First image of Comet Hyakutake was taken by John Kerns on 24 March 1996 at the Orange County Astronmer's Site near Anza, CA; an Olympus OM-2 camera with Ektar 1000 film was used. This is a 15 minute exposure with a 100mm lens at f/4 at 6:55 UT. The comet shows a distinct blue color, but the tail does not exhibit the filamentary structure shown in the photograph taken at 10 UT. 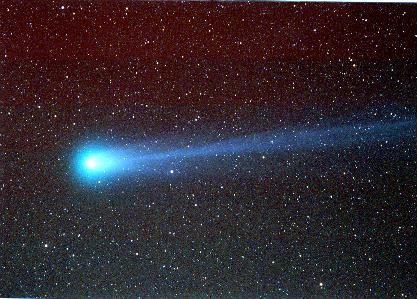 Second image of Comet Hyakutake was taken by John Kerns on 24 March 1996 at the Orange County Astronmer's Site near Anza, CA; an Olympus OM-2 camera with Ektar 1000 film was used. This is a 5 minute exposure with a 50mm lens at f/4 at 10:20 UT.